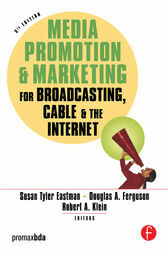 This fifth edition of the successful Promotion and Marketing for Broadcasting, Cable, and the Web, 4ed takes an important, timely look at the newest media venue, the Internet. Under its new title, Media Promotion and Marketing for Broadcast, Cable and the Internet, 5ed it takes a fresh look at the industry and the latest strategies for media promotion and marketing. The book explores the scope and goals of media production from the perspectives of network and local television, cable, Internet and radio, including public broadcasting. Topics include: goals of promotion; research in promotion; on-air, print, and Web message design; radio promotion; television network and station promotion and new campaigns; non-commercial radio and television promotion; cable marketing and promotion; research and budgeting for promotion; syndicated program marketing; global and international promotion and marketing; and online marketing and promotion.